Black Wednesday brought massive cutbacks at Cincinnati's last "local" daily newspaper. The reason I put "local" in quotations is because following each one of these waves the newspaper becomes less local, less intimate and more out of touch with reality as the industry deals with cutbacks in a corporate manner. There is an estimated 100 people being laid off at the Enquirer with 30 of those being reporters. CiN Weekly is going away, but being "rebranded" into Metromix. Enquirer Editor Tom Callinan tweeted, "Need to clarify: CiN in print and online will continue with Metromix as dominant brand..."
While that is true the CiN Weekly folks are still out of a job, and Cincinnati is seeing one of its weekly entertainment guides be replaced by a template-style national entertainment guide known as Metromix in 37 different cities/regions nationwide. Blogs will replace newspapers in the next 10 years. I think you will see a growing professionalism especially among bloggers who cover specific areas. Currently you can get the vast majority of what is "really" going on in Cincinnnati by folowing 20 or so bloggers, Business news, zoning issues, sports, restaurant reviews, neighborhood news and more. The first person who can consolidate all that content into a daily digest and can find a way to monetize it with local advertisement and pay the bloggers for their content will put the Enquirer out of business. The Enquirer knows this too! The thing is that I have never considered myself or my blog as being in competition with a news source like the Enquirer, but what seemed to happen over the years is that newspapers have grown more towards the blog end of things to try to keep up - this is the problem. People like myself and others are not full-time reporters...heck that's not even my professional training. Many of the bloggers are doing this as a passion and can not afford to pay themselves to do investigative reporting, extended feature stories and so on. This is where the newspapers should have focused. Instead they went to smaller stories, republication of press releases and a reduced grassroots/local emphasis. It's not the physical form, but rather then reduced content that has damned the newspaper industry. We saw the first wave of amazing bloggers born when newspapers began laying off Dining/Food review sections. We now have amazing food bloggers all across the nation and the amazing urbanspoon site that ties it all together in a way the newspapers will never be able to compete with again. The Enquirer barely boasts a business section as is, and the local urban-focused blog scene is as strong as it is because the Enquirer fails on that front as well. These niches open up as a result of the newspaper letting it happen...they reduce their content and that content goes elsewhere. The print newspapers around the nation need to start focusing on a new business model that is reflective of the changes taking place in our society...things are more local, more cutting-edge, more focused and more timely. I hope they get it together, because I love reading the newspaper every day. That will not happen by continuing to make cuts and get rid of those who make the newspaper the information source that it once was. 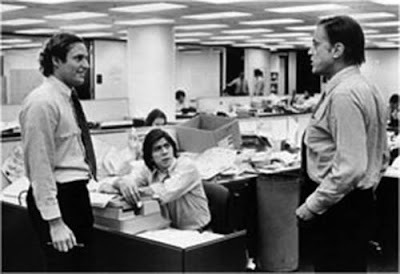 Image (source): Reporters Bob Woodward and Carl Bernstein from the Washington Post who helped break the Watergate Scandal to the public. There are a couple of models for web based investigative local reporting, something we've never had even when the Enquirer was making money. Take a look at minnpost.org and voiceofsandiego.com to see what can be done. There are still a few reporters in town who could put such a site together. ...unless they have noncompete agreements after they get laid off. Actually I think there are alot of bloggers who do blog as their full time job. The guys at Gizmodo, Engadget and Penny Arcade all started blogs out of personal interests and to the best of my knowledge they get their personal revenue entirely from ad space. ^I need to figure out that business model. When I first heard about voiceofsandiego on NPR, I believe the editor said they were making a go of it with a combination of grants and viewer contributions the way public media do. They've already won prizes for their reporting, by the way. The idea keeps getting tossed around that we need some sort of Cincinnati "super-blog" that pulls together content from all of the reputable local blogs. However, this already exists. All you have to do is use an RSS aggregator such as Google Reader. It allows you to enter the URLs of your favorite blogs, and it creates a feed that pulls together new posts from all of those sites. This also has the advantage of being completely customizable -- YOU and only you select which blogs are worthy of being included. The Chicago Tribune is already doing what you suggest in Chicago. Check out their site Chicago Now. It's basically a local HuffPo. Business model is the issue, Randy. I'm thinking a lot about it. And of course, the Huffington Post itself has its own Chicago and New York sections. Gothamist also has excellent local coverage in NYC, as well as sister blog sites in many other cities. I'd love to see something similar for Cincinnati. It has been said before. When a door closes, another one opens. -We work for our advertisers. -We work for our readers. -We have talented, flexible employees. It's no wonder they are having problems. When the publisher of a news sources sees her business as just that, a business, she fails the people. News sources demand credibility to remain relevant, but by writing for the purpose of selling papers, real news slips past unreported by the mainstream, and that source in turn loses credibility. To make up for the dipping readership that results, the source panders more to advertisers and the remaining readership, thereby damaging credibility further and alienating the readers who they lost in the first place. The process repeats until the newspaper dies. At the end of her letter to her readers, she asks for feedback, and gives her e-mail address. I took her up on that offer, saying what I just wrote here. I recommend you write to her and tell her what you think as well. I would much rather have a local newspaper than not, and I hope that, with time, the Enquirer can find again its focus to accurately and unbiased report the news, and understand its importance and role in our society. In doing so, they will regain my trust and I'll subscribe. Until then, I’ll pass. "The print newspapers around the nation need to start focusing on a new business model that is reflective of the changes taking place in our society...things are more local, more cutting-edge, more focused and more timely." ^ more local...but we must connect ourselves with our midwestern neighbors, the rest of the country, and the world! Local AND global.